"Beer goggles" which mimic the effects of drunkenness will be used in schools and youth centres to highlight the problems drinking can cause. 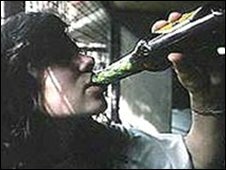 The goggles give youngsters around Windsor and Maidenhead the chance to experience what it is like to be intoxicated, the council said. They impair the wearer's responses by making it difficult to see clearly. The council's drug and alcohol action team plans to loan several pairs to schools and youth centres. Councillor Simon Dudley, the council's lead member for adult and community services, said: "The goggles show the effects of being under the influence of alcohol. "They are a very simple but effective way of showing young people how disorientated and vulnerable you become when drunk."